Amidst waves of uncertainty around finalisation of the land expropriation without compensation amendment, the persistent drought in parts of the country and on-going challenges surrounding energy supply in the agricultural sector, Laeveld Agrochem, a leading agricultural services company is ready to take farmers on board for a journey of hope with their second Seil-Safari. From 1-5 April 2019, Seil-Safari will bring together world-class speakers, agricultural experts and South Africa’s farming community to share knowledge and know-how on the latest innovations and solutions in the sector. 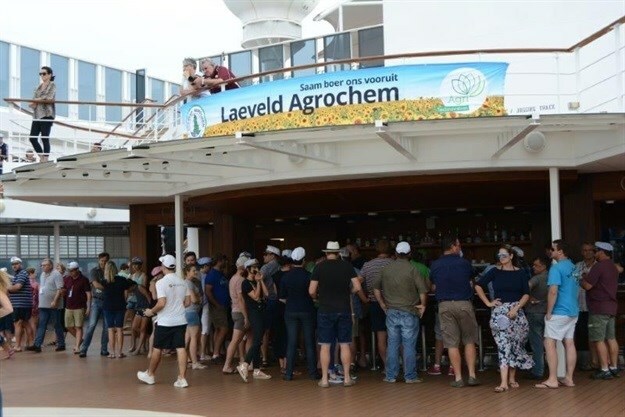 The network and information boat cruise started last year with its maiden voyage from Durban to Mozambique, which was well-attended by farmers and the agricultural fraternity, as well as their families. Laeveld Agrochem marketing director, Corné Liebenberg, says Seil-Safari is all about hope and finding solutions for farmers in a constantly changing and competitive sector. “We started the cruise as part of our strategy to find solutions for the agricultural sector,” he explains. “To achieve this, a collective effort is required, which is why different stakeholders have joined us to become part of the journey”. He adds that there is still enough rooms on board for public and private stakeholders who want to become involved in the initiative. Crop optimisation and plant nutrition are key focus areas for Laeveld Agrochem, and finding solutions for an ever-evolving set of agricultural challenges, says Liebenberg, has become second nature to them. Finding solutions for challenges is not new for leading agricultural company, Laeveld Agrochem, because through “our passion for precision farming”, he explains, Agri Technovation – a company that formulates and manufactures a range of specialised nutrition and soil health products to meet crop-specific nutrient, stimulant and energy requirements – was founded. Laeveld Agrochem has secured a list of top speakers for Seil-Safari 2019. Key speakers include Todd Cardwell, a senior agriculturist at Winfield, from America, who will give insights on adjuvants, application technology and new crop protection developments; Prof. Johan Willemse, an agricultural economist who will provide a market outlook for the year; and Prof. Ferdi Meyer, an agricultural economist from the Bureau for Food and Agricultural Policy. Further topics cover the spectrum from a look into sustainable agriculture with a focus on holistic planning and technology, to grain hedging on SAFEX and intelligent security technology. In addition, Dr Theo de Jager, president of the World Farmers Organisation, will share his insights on opportunities in other African countries. “Seil-Safari is an on-going journey of hope, and we believe it will play an increasingly important role in addressing the negativity surrounding the agriculture sector by directly and indirectly empowering and improving the lives of people from all walks of life,” he concludes.